Hello again, Ashes players! We are halfway through this wave of previews so far, but there’s plenty more to get hyped about! 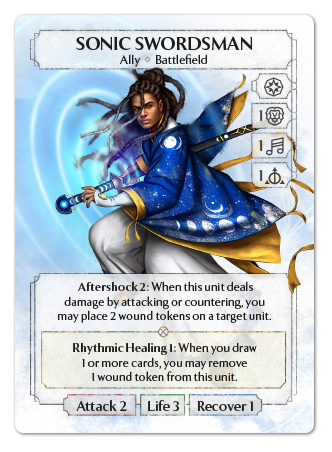 Today we will be taking a look at the Allies of Echo’s deck, The Masters of Gravity. Here we have a new application of the Parallel Cost mechanic we saw in earlier previews. This time, we have an Ally that can be played by using your Main OR Side action! This allows the Light Swordsman to enter the fray at a moment’s notice, or quickly equip itself for battle with big alteration spells like Crystal Shield, Undying Heart, or even Massive Growth! The Light Swordsman’s Opportunist 1 ability should be familiar for those who have seen Squall Stallions in battle, but this time it is paired with Battle Advantage! 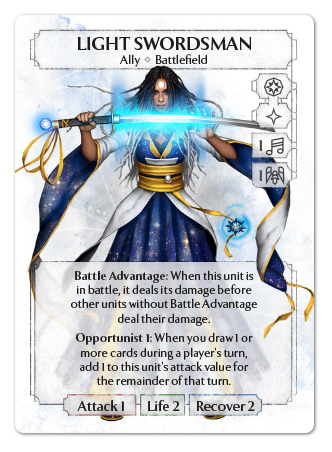 This Ally can make quick work of units like Shadow Spirit, whose Illusion ability means they will vanish from battle before they can touch the Light Swordsman! Next up we have the older sibling of the Light Swordsman and cousin of Hammer Knight; the Sonic Swordsman! Aftershock 2 is an incredibly potent battle ability, allowing this ally to take on multiple threats in battle, while bypassing the risk of the damage-preventing from Particle Shield. Taking the Attack a Unit main action with Sonic Swordsman can be a very effective tactic for landing an Aftershock 2 right where you want it! And let’s not look past the Sonic Swordsman’s other ability; Rhythmic Healing 1. This ability combines the healing powers of Divine magic with the card draw activation of Sympathy magic. The Sonic Swordsman is yet another unit that can benefit from the on-demand card draw of last week’s Changing Winds and other card draw effects, making it difficult for your opponent to chip away at this unit. 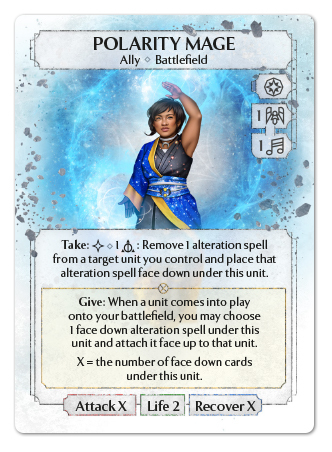 Last up for today’s preview is the Polarity Mage! Featuring a very affordable Parallel cost of only 1 or 1 , the Polarity Mage should be quite easy to fit into a deck of either magic type. Polarity Mage allows for some clever manipulation of alteration spells, both offensively and defensively. You can use the Take ability to quickly return your Regressed unit back up to full strength. Perhaps you can Take a Massive Growth off of your unit that already attacked, hide it underneath the Polarity Mage at the end of the round to ignore it's Fleeting ability, then sling it back onto another unit for free next round! The Polarity Mage is a very clever Ally, and its unique applications and interactions with alteration spells are only just beginning. I hope you have a good time experimenting with this Ally!